Please join us this Saturday 30 June for our next Seminar. Location: Sophia House, 225 Cross Road, Cumberland Park. Speaker: Diana Bordean, a physiotherapist who helps people with Fibromyalgia and ME/CFS. Topic: What can your physiotherapist do for you? Plus... ME/CFS Life Hacks. Bring along your favourite disability aid, piece of equipment or device. A Travelscoot and electric wheelchair will be available on the day to try out. 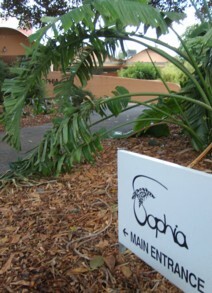 All seminars are held at Sophia House. Sophia House is at 225 Cross Road, Cumberland Park, at the western end of Cabra Dominican College, (i.e. the seaside end, not the hills end). It's ten minutes from the city centre by car or bus. Turn west (towards the sea, not the hills) from Goodwood Road. The carpark entrance is off Cross Road at the small Sophia House sign on a brick gate post. There's a walk from the carpark to Sophia House of about 50 metres but you can also be dropped off at the door as some people are. Buses from the city originate on King William Road (Bus G10, G20, G1) and travel via Goodwood Road (to Flinders University, Panorama and Happy Valley). Alight at stop 9 and walk west along Cross Road. This is about 450 metres, so may be an issue for most of our members. The Circle Line (Route 100) Stop 176 is about the closest you can get which is about 50 metres from Sophia's gate. Buses also travel from the city (Bus W90. W91) along Winston Avenue. Alight at stop 12, the Cross Road intersection, and walk east to Sophia. If you haven't been to Sophia House before, it is a particularly comfortable venue with chairs, a couple of sofas and a decent carpet if you are better lying on the floor. Bring whatever you need to be comfortable. Many people with ME/CFS are extremely chemically sensitive, so we ask attendees to refrain from wearing aftershaves, perfumes etc, and please refrain from smoking at our meetings. We will make every effort to clear the venue of fragrances and chemicals. There have been MCS issues there in the past and we have been in contact with Sofia's management to find ways to minimise or remove any potential issues for future meetings. We will continue to make every effort we can to minimise these problems at our meetings.